This is a 2 player game. Each player takes a game board (an Easter Basket). 1, 2, or 3 dice are needed for this game. For younger students, roll one die and place the correct number of eggs on their pot of gold. 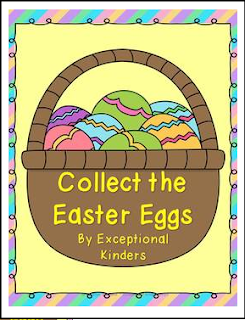 Older students can roll 2 or 3 die and add the numbers together to get the number of eggs they should take. When all of the eggs are gone, the students count the eggs on their game board. The player with the most eggs wins. 1/12/14: I have added counters for counting my 2s, 5, and 10s to this file. Thank you for viewing my Collect the Easter Eggs Game Freebie! I hope you enjoy it!